The most striking thing about Cubbarros is the nearly untouched pristine reef where endangered species grow large and healthy, and undiscovered marine life abounds. Although it’s only fiction, there are such places left on Earth. Sadly, around 25% of the world’s coral reefs are gone, and almost all underwater habitats are threatened in some way by human activities. But there remain some places that still give us a glimpse of what a healthy ocean should look like. Cubbarros was modeled after one such place. 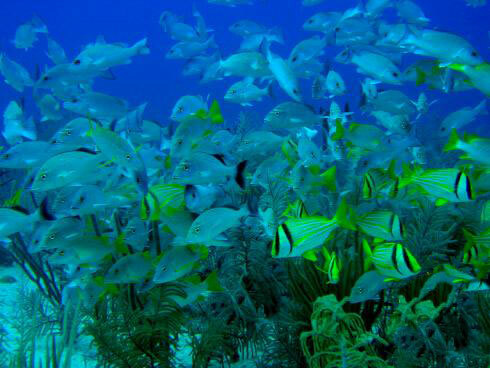 Los Jardines de la Reina which means the Queen’s garden is a reef off of Cuba where commercial fishing has been limited and there is little runoff from the land. "Government conspiracy drives the danger in this absorbing near-future apocalyptic tale of underwater intrigue . . . .Conyer's descriptions of Alannis' dives are full of sensory details that will bring readers closer to Alannis' adventures."
. . . a hypnotic suspenseful debut novel that will appeal to young adults and adults alike. Author Kara Lynn Conyer has written a page-turning, deep-sea thriller with an intricate plot that is masterfully revealed and keeps the reader hooked from page one." "Restricted Waters is full of drama and moves along quickly, taking you into the depths of the ocean. Such vivid descriptions, you'll definitely feel as though you're on the expedition . . . the perfect read for any young budding marine biologist."